Eight children from Year 5 were recently selected to take part in LCFC's 'Science Stars' community initiative at the National Space Centre. 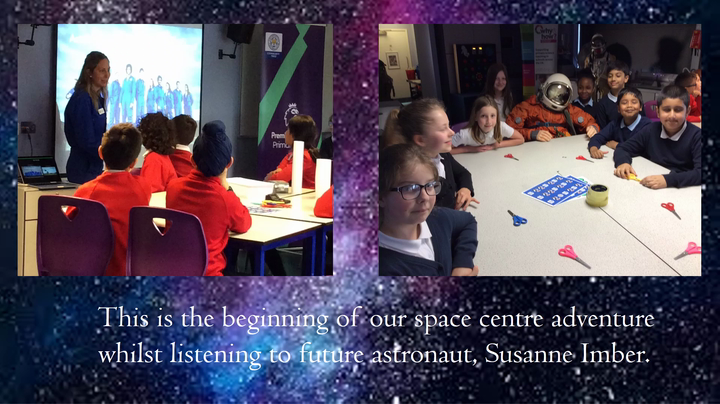 During the afternoon, our science stars met Dr Suzanne Imber - a real-life astronaut - and took part in a range of workshops which were filmed by the BBC for screening on Match of the Day and CBBC's 'Kickabout' programme. Ex-Leicester City star Matt Elliot was on hand to help our children make rockets for a spectacular blast-off as an exciting climax to the session. Ben Shires of Guinness World Records fame will be presenting the programme, which could include footage of the Beaumont Lodge children that he interviewed at length! Please see the Powerpoint of the trip which was created by the eight children from Year 5 who attended.